Charles A. Becker (Jr.) was born in 1915, St. Louis, Missouri. His father (also Charles A.) and uncle (William E.) cofounded a paint company which eventually became part of the Benjamin Moore Paint Co., continuously well known today. Charles Sr. passed while his son was still a young man, leaving to his wife and only son his share of the company. Over time, that inheritance evolved to become the legacy of the Charles A. Becker Foundation. After serving in WWII, Charles – Charlie as friends called him – moved to Phoenix, Arizona, from St. Louis, with his mother. Exhibiting good stewardship as a young professional, he accepted management of the family inheritance. Charlie respected his good fortune, and while making a lot of it, he also chose to live modestly. Charlie loved to travel around the globe, a passion that began early as a child with his family, and he continued frequently throughout his life. Travel opened his eyes, both to the world’s wonders, as well as human disparity. He had a great appreciation for being born in the United States, and engaged in ways to help young people less fortunate. Charlie had no children of his own, though his commitment to the causes of children and young people made him indeed father-like. Throughout his life he took pride in helping young people who exhibited ability and talent. He funded college scholarship programs, and directly helped young people begin small businesses. Also, believing that learning by observing was possible at any age, he shared the world of travel with many people who may not have had the experience otherwise. Helping those who proved commitment, enthusiasm, and initiative was his completely fulfilling pursuit. CABF was funded during Charlie’s lifetime through an estate plan of charitable trusts and gifts, so that he could participate in guiding and steering its direction. 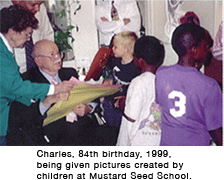 Charlie planned carefully to create a legacy to last for generations beyond his life, all in character to his memory and history of thoughtful charitable giving.